FC400-DAC is a compact weighing Indicator with D/A converter. It is suitable for many weighing applications such as hopper scale, packing scale, weight level meter, etc…. Either voltage or current output, corresponding to the indicated value, is available. It can be fit into a limited space! Light weight & compact body for 35mm DIN rail mount. Equipped as standard with D/A converter, RS-485 , and USB interface. High-speed A/D conversion rate at 1200 times/sec. & high display resolution capability of 1/100000. 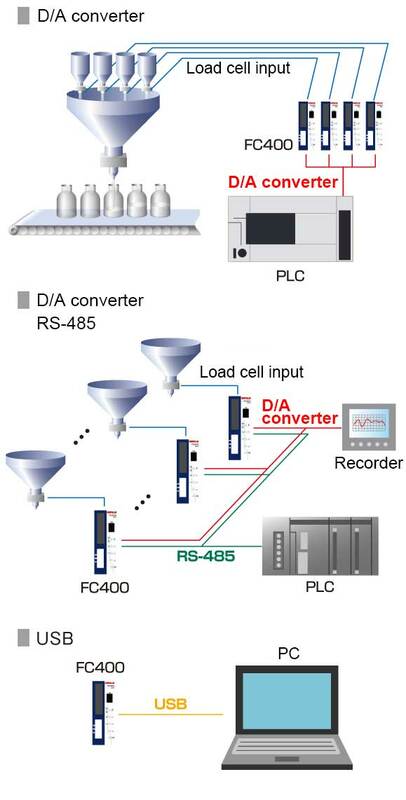 The high-speed A/D converter enables the faster and more accurate weighing. With the powerful filter against noise, high-speed an high-accuracy weighing can be achieved. The filter is automatically adjusted to reduce the noise when the auto adjustment key is pressed. Theoretical calibration can be performed easily by registering the capacity and rated output of the load cell(s). Three additional points can be defined in the middle between zero and span to improve the linearity. The output signal level of the connected load cell can be displayed in mV/V/ for monitor purpose. Sequential control can be performed without external devices like PLC. Multipoint calibration function: Up to three additional points between zero and span points can be defined. Selectable from 3, 6, 13, or 25 times/sec. Either contact type (relay, switch etc.) or non-contact type (transistor, photocoupler etc.. ) can be connected. ON when short-circuited with COM. * The external power supply (DC24V) needs to be prepared by user. Operating temperature range: -10℃ to +50℃.